[AUTO](RC):[Counter Blast (1) & Put this unit into your soul] During your opponent's end phase, when an opponent's locked card is unlocked, if you have a «Link Joker» vanguard, you may pay the cost. If you do, lock that unit. ...personally, this card is just annoying to go against regardless of whom the Link Joker's final ace is. The fact that Palladium here is made to keep that disruption factor that the Lock effect really has on the opponent by keeping it locked and either severely weakening attacks or even preventing them from ever happening to begin with at the cost of himself. Now, it would be bad if it was just retired and you'd never see it again, but I personally see this as beneficiary as possible by it going into the Soul as Chaos Breaker Dragon will have more Soul food to eat when you want to start killing things and begin drawing more cards and just plus sing in general. There are two major drawbacks to Palladium however. One is that you have to be able to actually Lock something to begin with, and if you are unsuccessful at Break Riding with Infinite-Zero Dragon, then it'll cost you even more Counterblast to even get the Lock to begin with let alone retaining it. The other drawback is that you end up losing Palladium by it going into the Soul and losing a 7,000 power supporter, but seeing how he's able to potentially stop a single attack from even happening singlehandedly is just phenomenal and worth the loss especially if you can reinforce it when the spot is open anyway. Palladium is made to be more of a defensive card with offensive stats, so while others sleep on this card *looks down*, I personally am keeping an eye out against this card. Next Time: While it's not from Set 13, it's still a Grade 1/7,000 Power that I believe that this card deserves a lot of acknowledgement! 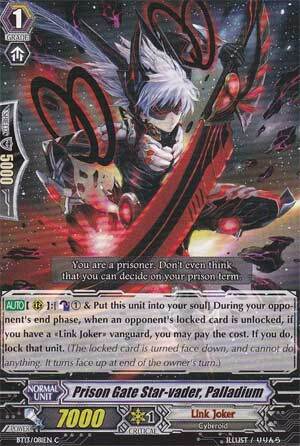 4th card of the week is Link Joker's newest troll card, Palladium. When a unit unlocks during the End Phase, you Counterblast 1 and move him from RG to the soul to lock it again. Hooray, finally I can talk about this card in more detail than the others. Firstly, this card is pretty neat in Chaos Breaker Dragon decks. His uses are fairly extensive, with the most obvious being he fuels the soul for Chaos Breaker's Limit Break. He can also shut down a front row and thus a whole column for another turn without Chaos needing to commit anything else from the hand. Especially if you have a better booster and need to sack it away nice and neatly. He's also good for when you are stuck riding Chaos on turn 3 and you're reduced to playing the stall game until you can Chaos Retire away their units. However, if your actual gambit of Chaos Breaker over Infinite Zero works, Palladium's pretty redundant, unless you absolutely need one of their columns re-locked for any reason, since locking generally isn't as good as retiring in terms of long-term benefits. The fact he now has Colony Maker to search him helps too. I'd run him, if only because to give Chaos more shots at retiring and also because Link Joker has plenty of 7k boosters to play with.